This is Kaleigha's permanent expression on her face! She is such a happy little girl! Don't let Kyle fool you if he says he treats Kaden and her the same.. He loves his son very very much, but Kaleigha holds a special place in Daddys heart! Kaden had a Birthday party to go to at Chucky Cheese (his "Buddy KK" was turning 2). So this picture was not taken without Kaden on purpose, we tried to get him to take it with us. Apparently he was having too much fun with all of his friends! But I just love this picture of us three!! It just reminds me of how much both of my children look like their father..
To anyone who still reads my blog.. 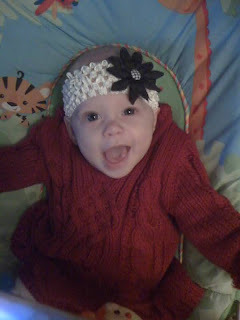 I am going to start by apologizing for not updating my blog and introducing my little baby girl! This is my angel Kaleigha Rayann Thomas. Isn't she the sweetest!?! She is almost 9 months old and weighs 15 lbs 15 oz. Her and Kaden do so well together! He knows how to make her smile and how to make her cry big crocodile tears..
Our little family started on our wedding day in the Bahamas then became a little bigger when we had our son Kaden (our pride and joy) on Nov. 5th '07. Little something you should know about Kaden is that he was born while we were traveling from IL to ABQ. He was born in Joplin Mo, that sums up how hectic our life is...! We are a loving, exciting, christian family!